There’s a number of possibilities for day trips from Dubrovnik to Bosnia & Hercegovina as the border is so close to the city. Read on below for which towns to visit and how to get to them from Dubrovnik. If you are planning on making a trip to to Bosnia please double-check that you don’t need an additional visa for this country. (Although you may not need one for Croatia, you might find the opposite is true for Bosnia.) You can do so on the Bosnian Ministry of Foreign Affairs website. Mostar is a bit of a journey from Dubrovnik but well worth a visit if you don’t mind the extended travel time. At present, unfortunately, there don’t seem to be any buses that allow for a day trip from Dubrovnik to Mostar. You would need to stay (at least) one night as the return buses leave in the morning. As such, an organised tour from Dubrovnik to Mostar is a better way of making this day trip. For example, there’s the Mostar Day Tour from Dubrovnik organised by Viator. The 12 hour tour takes in all the sights of this wonderful Bosnian town, with free time to do your own exploring too. To combine visiting Mostar with Medjugorje, you could also join the Small-Group Bosnia and Herzegovina Day Trip from Dubrovnik including Medjugorje and Mostar or the Private Tour: Medjugorje and Mostar Day Trip from Dubrovnik. Mostar is a wonderful town, most famous for its Old Bridge (Stari Most) over the River Neretva, which was the first single span stone bridge ever built in 1566. 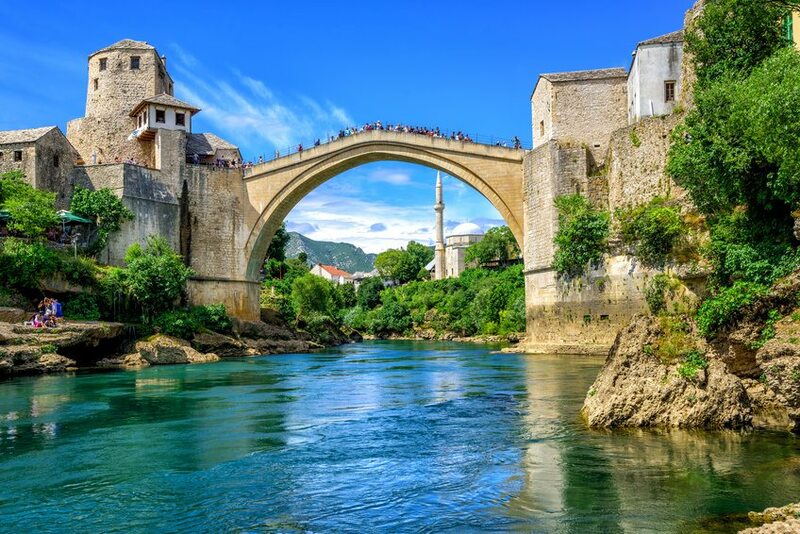 The bridge is how the town got its name, of course – “most” meaning “bridge” in Bosnian, and those that guarded the bridge were called “Mostari” which eventually evolved into the Mostar for the area. Aside from the Old Bridge, the town has numerous other sights and places to visit including the Old Town, and various mosques and churches. If you are there during July, the famous Mostar bridge diving competition takes place. Check locally for the exact date of the competition. See more at Mostar Tourist Office and the Bosnian Tourist Office – Mostar page. 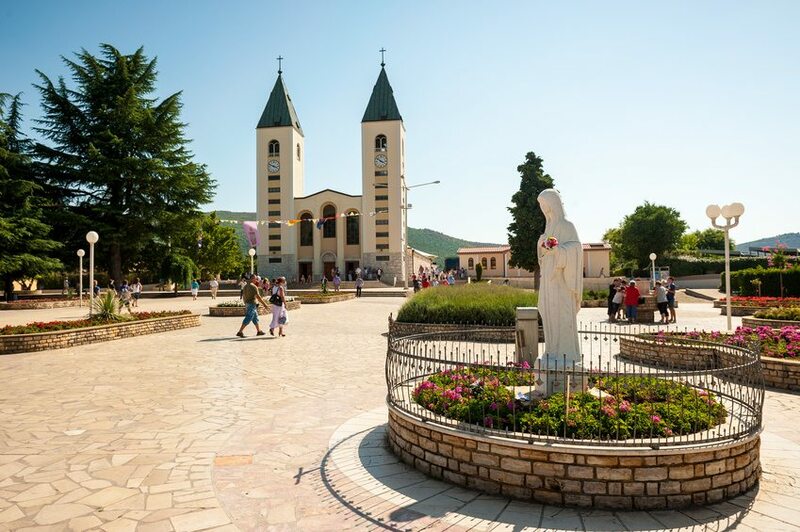 If you do want to make a day trip to Medjugorje from Dubrovnik, it is advisable that you book an organised excursion through a local travel agency. You can also pre-book a tour online with Viator, who offer an 11-hour Medjugorge Full-Day Trip from Dubrovnik. Alternatively, there’s the combined Mostar/Medjugorje tours such as the Small-Group Bosnia and Herzegovina Day Trip from Dubrovnik including Medjugorje and Mostar or the Private Tour: Medjugorje and Mostar Day Trip from Dubrovnik. Medjugorje is most famous for apparent visions of the Virgin Mary, which have appeared to several people over the years. It is now a popular place for pilgrims to visit as a shrine. Details of Medjugorje at Medjugorje.org and Medjugorje.net, and also from the Bosnian Tourist Office – Medjugorje page.